They say that the luckiest people in the world make their own luck without relying on fate to deal them their hand. I suppose the more hardworking one is, the “luckier” one would get, but when it comes to food and you have absolutely run out of ideas on what and where to eat, perhaps it is time to let fate intervene. What better way to do so than with the £29.99 Foodie Dice? Forget about your regular cooking routine – with the Foodie Dice, you will be able to follow up on your roll by going on an unprecedented shopping experience before you cook and eat. There are more than 186,000 mouth-watering and adventurous combinations, offering instant inspiration for creating simple seasonal meals. 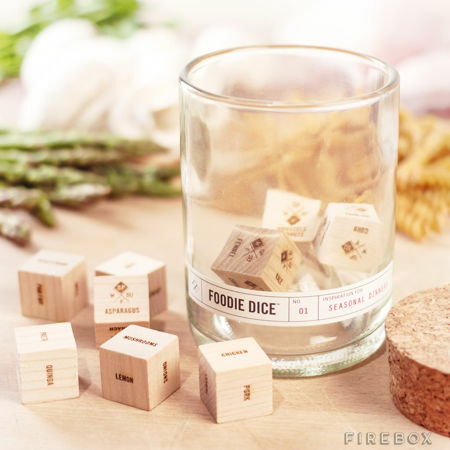 The Foodie Dice comes housed within a jar made from an upcycled wine bottle, where there are 5 primary dice and 4 seasonal veggie dice which offer inspiration for creating simple, seasonal meals. Protein, Cooking method, Grain/Carb, Herb, Bonus ingredient + Spring, Summer, Fall and Winter Veggies.